Its December and its freakingly cold outside! Seattle is seeing freezing temperatures since past week. After coming home in evening, I do not even let any toe fingers out of the blanket. This kind of weather demands comfort food. And should be quick to make so that you don’t have to spend an hour in the kitchen to prepare the dinner. 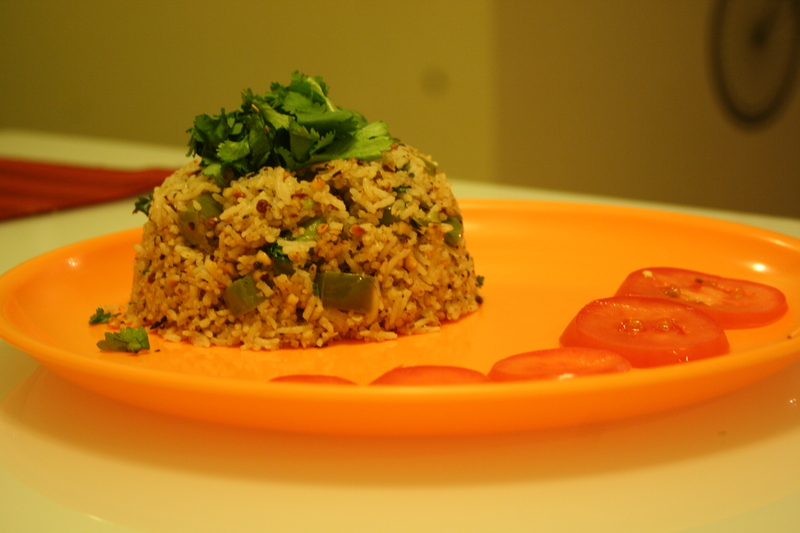 Capsicum masala rice is the perfect meal which met all my requirements. Its yum, its quick to make and its just another name of comfort for me since I love rice so much. I freshly prepared the masala at home which added heavenly flavor and aroma to the rice. To ground the masalas I used my electric vegetable chopper. Oh yes, you heard it right, chopper. Whenever I have to coarsely grind anything, I use the chopper instead of the grinder which often results in a paste. Its also a lot easier to clean. You can also store the masala in an air tight container for up to a couple of months. For the masala, heat a tawa. Keep the heat on medium and add mustard seeds, cumin seeds, dried red chillies and urad dal. Do not add ghee/oil, masalas have to dry roasted. In the meanwhile, dry roast the peanuts in microwave for 2 minutes with 30s intervals. Keep a close eye on the masalas. After a minute of so, uard dal will start changing color. Keep stirring the tawa so that masala does not get burnt. A very strong aroma will start filling your kitchen and once mustard seeds start spluttering, switch off the flame. Add the curry leaves and mix. After 30 seconds, transfer the contents to a food processor/chopper. Add garam masala and blend the contents well. You should be aiming for a coarsely ground powder. Cool completely and keep aside. Heat a wok and add the butter. Before butter starts turning brown, add finely chopped capsicum. Saute the capsicum for 5 minutes until its half cooked. Take care to not overcook the capsicum, it should have a crunch to it. Add some salt and add the masala prepared in previous step. Mix well. Now add the parboiled rice and toss thoroughly. Switch off the flame. 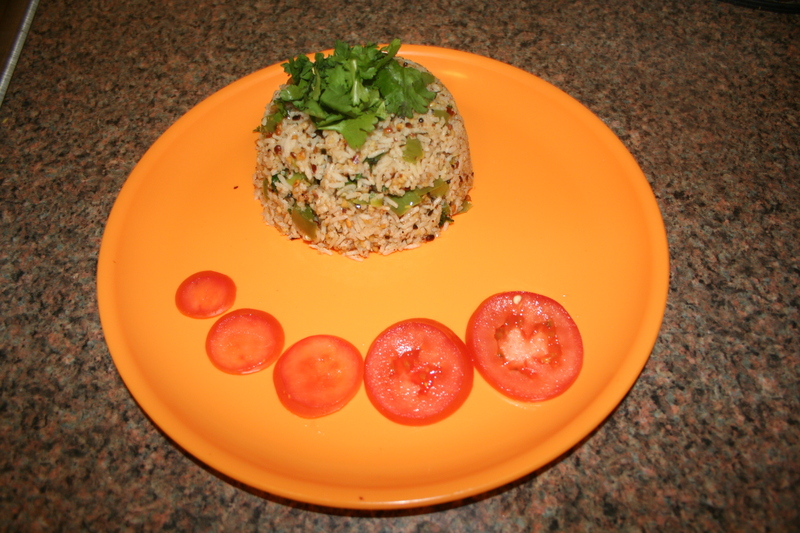 Garnish with fresh chopped coriander leaves and serve hot with raita, pickle or as it is. Thanks for stopping by and let me know your suggestions and thoughts!